Greenbriar Picture Shows: What Says America Like Superman, Baseball, and Sharkey The Seal? The first Superman Serial is allright for a post-James W. Horne Columbia Serial, better is the second one, ATOM MAN VS SUPERMAN, which benefits greatly from a vastly more entertaining villain in Lyle Talbot. Kirk Alyn is no George Reeves, but I've never had a problem with him in the role, but having never been a great comic book fan, nor a great fan of comic book movies or recent movies in general (hence not even knowing about MAN OF STEEL until your mention of it), I can't say I was particularly concerned about Alyns portrayal. 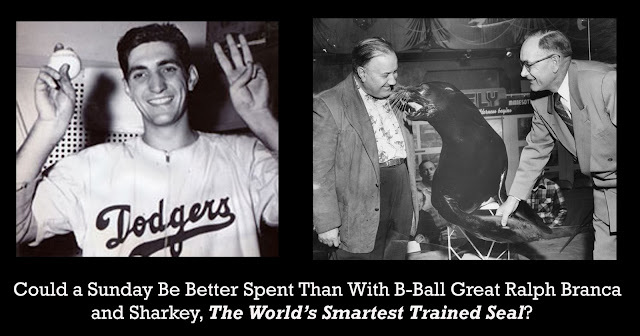 Sharkey the seal was featured in Abbott & Costello's Pardon My Sarong. You may recall the A & C blooper reel where Sharkey gives Lou a hard time, and Lou's blubbery character "Wellington" turns into salty, "get the hell outa here" Costello! Nice to see Bring 'Em Back Alive making a comeback in '48. I'm surprised RKO could swing it, given that the film was originally a Van Beuren production for RKO release. Most of the Van Beuren library had passed to other hands after 1937. Must admit. My favorite film seal was Sammy. He was 'way out." 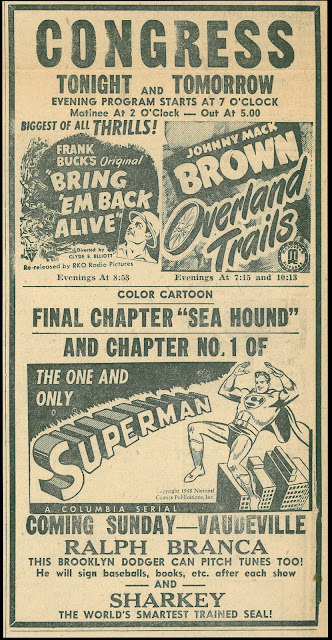 I saw the Kirk Alyn serial as a kid in the '50s, when George Reeves was still playing Superman on TV. Haven't seen it since then, but I remember liking it well enough at the time (though I did feel cheated by the cartoon flying). As for Man of Steel...well, John, I couldn't consider myself your friend if I didn't tell you to run, don't walk, as fast as you can away from any theater playing this stinker! James Abbott nails it with surgical precision (truth to tell, he had me at his title). I didn't do it half so well, but for the record, my take is here. 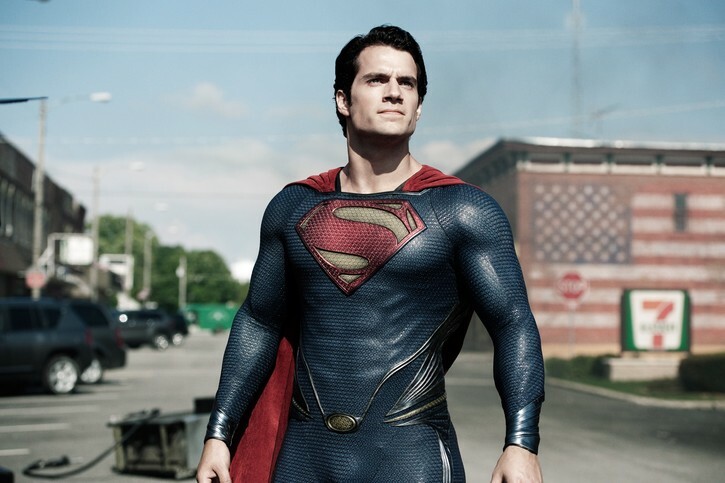 MAN OF STEEL has dropped like lead in water in its box office. Unfortunately that will be attributed not to the film but to SUPERMAN. Reg: I think (hope?) it may be the other way around: the $643 million will be attributed to Superman, the leaden drop to Man of Steel's word of mouth. I didn't know that Ralph Branca could carry a tune, as well. I bet you didn't know that he was also a 20-game winner on CONCENTRATION, and competed in the show's first "Tournament of Champions" in 1963. This public appearance was three years before the moment that Branca had the moment that made him immortal/infamous...throwing the pitch that Bobby Thompson turned into "The Shot Heard 'Round the World", winning the 1951 National League pennant for the New York Giants over the Dodgers.